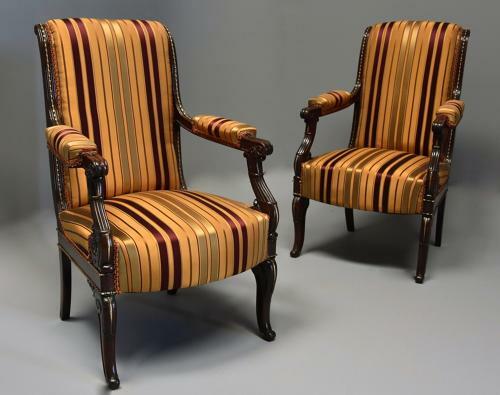 These superb chairs consist of an upholstered back with reeded rosewood supports with brass ball bead decoration. These lead down to the padded arms with scrolled and reeded arm supports with brass embellishments with an upholstered seat and rosewood seat rails to the sides with brass ball bead decoration. The chairs are supported on carved scrolling cabriole legs to the front and sabre legs to the back. The chairs are upholstered in a striped fabric which is in good condition - however the chairs could be re-upholstered once purchased.